FLIGHT Centre is forecasting another year of double-digit growth in pre-tax profit as cheap fares and a strong dollar continue to encourage Australians to travel abroad. Australia’s biggest travel agency yesterday unveiled an annual net profit of $139.8 million for the year to June 30, almost unchanged on the previous year. But underlying pre-tax profit rose almost 20 per cent to $245 million due largely to the performance of its core Australian business. Managing director Graham Turner said healthy demand for international travel due to cheap fares and a strong Australian dollar had helped offset weaknesses in domestic tourism. International fares had increased only modestly since the global financial crisis in late 2008. The corporate travel market remained strong, but Mr Turner said ”we are just finding trouble getting growth in domestic leisure”. Flight Centre’s income margins were squeezed slightly during the year because of strong competition in the retail segment and its increasing exposure to corporate travel. The company has forecast a pre-tax profit of between $265 million and $275 million for this financial year. It is expecting growth of 10 per cent in all of its markets except the US. ”We are confident we can build on the profit this year barring any major misfortunes,” Mr Turner said. ”The year hasn’t started off too badly and we have our fingers crossed and a couple of toes as well. Shares in Flight Centre rose almost 4 per cent to $18.66 yesterday. While adopting a bullish outlook compared with many retail-exposed sectors, Flight Centre cautioned that economic conditions remained volatile, particularly in Britain and the US. The company described the performance of its British operations over the past financial year as disappointing. It had witnessed a softening in demand since the British government implemented austerity measures. In the US, profits from corporate travel helped overcome small losses in its leisure and wholesale operations. 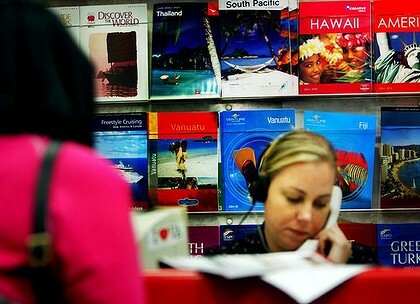 Flight Centre has stripped out $30 million in annual costs from the US business. The company will pay a final dividend of 48¢ a share on October 7, taking the payout for the year to 84¢.